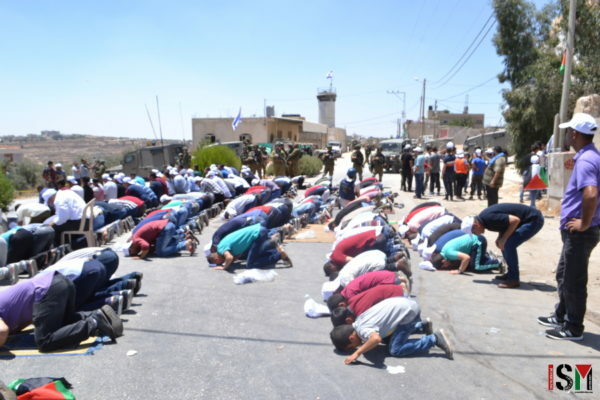 Palestinian ex-prisoners, who have had their salaries cut by the Palestinian Authority (PA), performed Friday prayer in the sit-in tent erected in al-Sa’a square in Ramallah for the 48th day in a row. 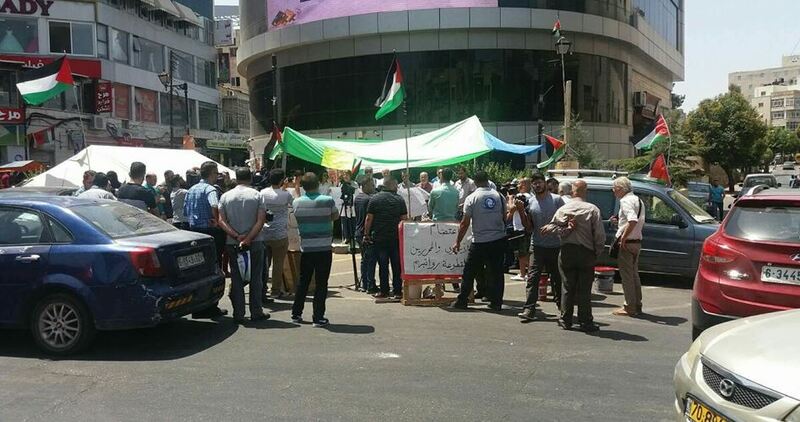 Seven days ago, the ex-prisoners announced launching an open hunger strike in protest at the PA’s refusal to respond to their demands and to demand it to backtrack on its decision to suspend their salaries. 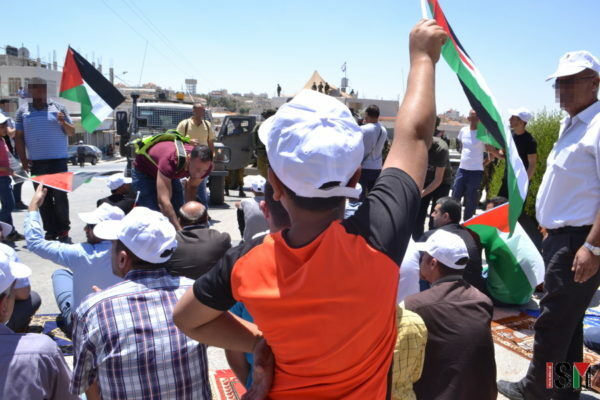 Another protest was staged in front of the PA government’s headquarters for a couple of days before the PA security services dispersed it by force. The PA decided three months ago to suspend the salaries of about 300 prisoners and ex-prisoners who were released in the Wafa al-Ahrar prisoner swap deal. The PA Ministry of Finance claimed that the order was issued by higher authorities. First Deputy Speaker of the Palestinian Legislative Council (PLC), Ahmad Bahar, called on Friday on Muslim and Arab governments to shoulder their responsibilities toward al-Aqsa Mosque and protect it from the Israeli division schemes. 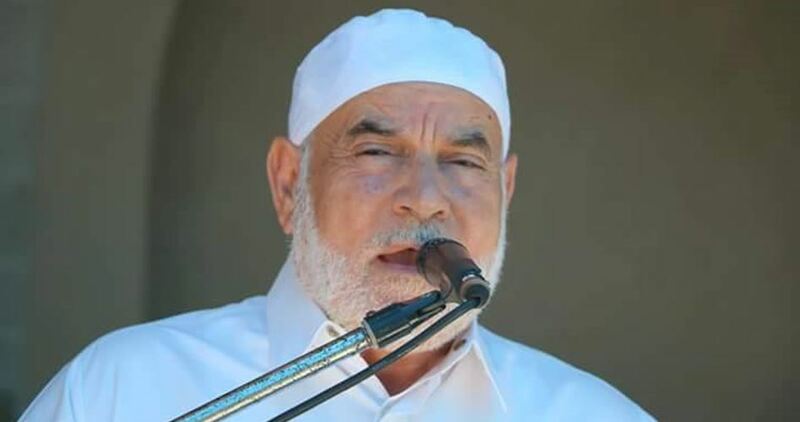 Bahar denounced in his Friday sermon the detention of the Palestinian MP Mohammed Abu Teir, who was expelled from Jerusalem to Ramallah following legislative elections in 2006, and said that the Israeli policy of kidnapping Palestinian MPs will not succeed in thwarting the work of the PLC. He asked the United Nations to intervene to protect the parliamentary immunity of the Hamas-affiliated MPs. He called for supporting Jerusalem politically and economically to strengthen the steadfastness of its people and approving a unified national plan to confront the Israeli racist schemes targeting the city. Bahar affirmed that the Palestinian resistance will remain the main defender of the Palestinian cause, stressing the need to escalate the Jerusalem Intifada. Haifa Chemicals said on Wednesday it was closing shop and letting go of its 800 employees after failing to find a reasonable alternative to a large ammonia tank it needs to function which was ordered to be shut down earlier this year. An Israeli court in February ordered the company to shut down the country’s largest ammonia tank, which has been a point of contention for years, with residents and environmental groups warning it is a major health hazard. “Haifa Chemicals management decided to close the company and is forced to fire all its employees,” it said in a statement. The colossal, circular vat is located in the northern port of Haifa, Israel’s third largest city, and can hold 12,000 tons of ammonia, which is used in products such as fertilizer and explosives. The government, looking to remove hazardous materials from the heavily populated area, has for more than a decade been looking for alternatives to the Haifa plant, including building a new one in the middle of the desert. It has made little progress. Haifa Chemicals is owned by a U.S. holding company Trance Resource Inc (TRI), which is controlled by Florida-based Trump Group. This has no connection to U.S. President Donald Trump. 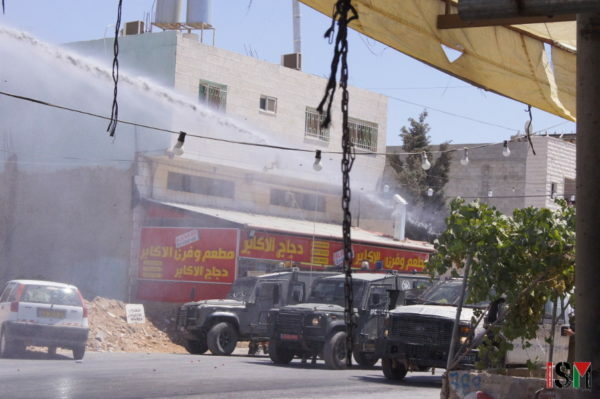 BETHLEHEM (Ma’an) — Israeli forces raided the village of Yabad in the northern occupied West Bank district of Jenin on Saturday, as clashes broke out between the Palestinian residents and Israeli armed forces, while at least 5 Palestinians were detained, including a 12-year-old boy. 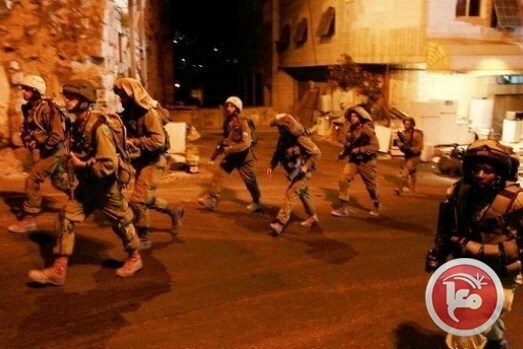 Yabad’s mayor Samer Abu Baker reportedly told Palestinian news agency Wafa that Israeli forces raided the village after midnight, causing clashes to erupt between Palestinians and Israeli forces. Israeli forces reportedly fired rubber-coated steel bullets, tear gas canisters, and stun grenades at the residents, causing several Palestinians to suffer from tear gas inhalation. Abu Baker also reportedly said that a 12-year-old Palestinian boy was “taken from his home,” presumably detained by Israeli forces for interrogations. However, Abu Baker did not provide Wafa with further details of the incident. 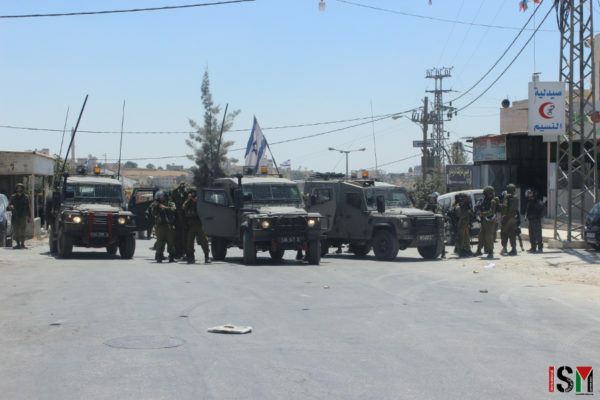 According to Wafa, four other residents of Yabad were detained and transferred to interrogations at the Israeli Dutan checkpoint south of the village, and were eventually released. 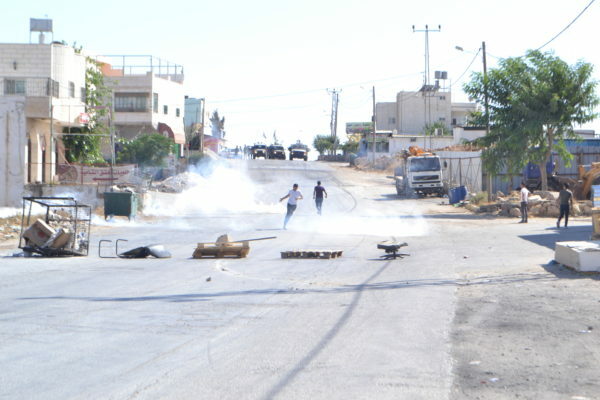 An Israeli army spokesperson told Ma’an she would look into reports on the detentions and clashes in the village. Prisoners’ rights group Addameer estimated that 6,128 Palestinians were held in Israeli prisons as of July, including 450 without charge or trial. Last week, Israeli occupation authorities handed out demolition threats for 14 Palestinian homes in Al-Walaja village, about four kilometers northwest of Bethlehem City, under the pretext of having no building permit, and refuses to give them any permits at the same time. The families, whose homes would be demolished by 9 August, live in an ongoing state of fear and anxiety for their future, especially that they have built these houses themselves and over the years. 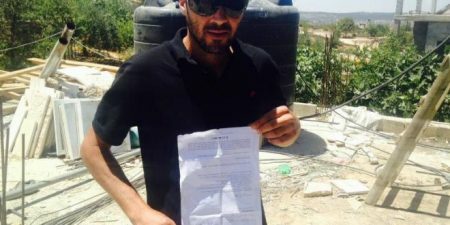 Ahmed al-Atrash said that Israeli authorities served him with the decision to demolish his house, which he built on top of his parent’s home. The family home was inhabited by 15 people, a few days ago. The parents’ house was the first house to be demolished in the village, in the past. The family has a deadline to object, until 11 August. Ahmed says that the occupation refused all attempts to halt the demolition order. The lawyer offered his signature on a paper and vowed not to continue construction on the second floor in order to protect the ground floor where the family and all its members live. Al-Atrash called on all Palestinian parties and human rights organizations to support the family, saying that he is continuing with the Arab members of the Israeli Knesset and representatives of human rights organizations to ensure that the house can not be demolished, which could lead to the demolition of the family home on the first floor. For his part, head of the Al Walaja village council, Khader Al-A’raj, called on Palestinian political and legal authorities to support the steadfastness of the village of Walaja on more than one level, to be ready and capable of confronting the occupation’s plans, which aim to displace the villagers. The village of Al Walaja, PNN further reports, has been a target for the occupation, and demolitions are one way to empty it of its people. He added that occupation authorities have demolished about 70 houses in the village since 1948. Head of the PSCC, Munther Amira, said that the plans to target al-Walaja come within the framework of a protected campaign launched by the Israeli occupation and its settlers, represented by the government of the extreme right, which is based on the expansion of the settlements and ensuring its survival in the government. Amira added that the tour was part of the ongoing attempts and efforts to expose the practices of the occupation and address them by various means, stressing the need to unify the various legal and field efforts because the unification of efforts proves that the Palestinian people are able to achieve field victories, which was proven during the attempt to impose new measures to control the Al-Aqsa Mosque, recently, and the failure of attempts to implement their own rules. For his part, lawyer and activist Farid Al-Atrash, who is director of the Independent Commission for Human Rights, said that the suffering of the village of Al Walaja is due to unjust practices imposed on the Palestinian people, and is a model of the land confiscation and policy of house demolitions targeting to displace the people, and requires our collective intervention. Pro-Doha government are endeavoring to use the anniversary of the Kuwait occupation in favor of the Qatari crisis. They claim that Qatar today is in danger like Kuwait was in the past and that Saudi Arabia and its allies represent Saddam Hussein! Regardless that this is a forging of truth, it is also historically stated that Qatar is the only Gulf country that tried to hurdle the liberation of Kuwait through forbidding the GCC decision to adopt a military action to liberate Kuwait during December meeting in 1990. Crown Prince, then, Hamad bin Khalifa Al Thani insisted that there is no liberation of Kuwait before obliging Bahrain to relinquish the conflict islands with Qatar, upsetting the five countries that obliged him to back off or leave Doha. At that time, Saddam Hussein forces were residing in Dasman Palace in Kuwait, and more than 1.5 million Kuwaiti citizens and residents were displaced. Weirder, though, was the stance by the Muslim Brotherhood – current ally of Qatar. Muslim Brotherhood was also frank towards the liberation via a stance expressed by the International Organization Of The Muslim Brotherhood in Jordan, Egypt, Sudan, Tunisia and others. It justified its support of Iraq’s invasion of Kuwait to its objection over the military solution and the recruitment of foreign forces! In fact, it was cooperating with Saddam’s government to replace Al Sabah family! At the anniversary of the Kuwaiti occupation, the Qatari and some Kuwaiti media are promoting two issues: reducing the role of the GCC – including Saudi Arabia – in that crisis, and comparing the Qatari crisis to the Kuwaiti occupation. But the truth is the total opposite since in this crisis Qatar is the offender and the four states are the victims. The situation might seem strange because Qatar is a small country, but the four states have been patient over its policy and dangerous acts for years not because they are weak states but because Qatar is a small country and there was some hope that the leadership might become rational with time. You might wonder what crime did Qatar commit to compare it to Saddam. For years, Doha’s authorities have been working on destabilizing and ousting regimes of Bahrain, Saudi Arabia, Egypt and UAE. I listed them according to the damage. Qatar is funding the opposition against Saudi Arabia in London, Turkey and Qatar itself – an opposition demanding throwing out the regime. Qatar was an accomplice in the assassination of King Abdullah, and it admitted conspiring with Gaddafi to oust the regime in Riyadh. Everytime, it presents excuses and pledges to halt this policy before it returns to it! Two months ago, it promoted a revolution holding the title of “7 Ramadan Movement”, and bribed agents to serve this purpose. As for its acts in Bahrain and Egypt, then it is obvious through the state-channels that Qatar supports the extremist opposition in Bahrain to oust Al Khalifa and funds the Muslim Brotherhood to throw out Sisi. Only Qatar supports and funds Emirati opposition abroad! These states said that they have ran out of patience and it is time to set limits for Qatar. Brothers in Kuwait must recall that these four states mobilized to rescue their country when Saddam ousted the regime, and Kuwait should stand by them out of loyalty or at least should not allow Qatar to exploit Kuwait on any level (political, media, economic). What is the difference between what Saddam did in ousting the regime in Kuwait and what the Qatari government is doing? In fact, Qatar is worse because it hides behind slogans and claims of democracy and Islam – both unfamiliar with it. At the anniversary of Saddam invasion of Kuwait, we should be aware of the tough and costly lesson, to be more keen to respect ties and treaties and to support each other stability. The Gulf countries should be more strict against the Qatari’s government acts and to support the demands of the four states, since they didn’t ask for ousting the regime but for stopping the threats against their security and existence. If Kuwait and other states take a just stance, then Doha might be more rational and rescue the region from the Gaddafi mentality. The Syrian Coalition continues with the efforts to keep open channels of coordination and communication with the Syrian refugees in Lebanon and to follow their situation closely. As part of these efforts, the Coalition’s political committee held teleconference with civic groups in the Syrian refugees’ camp in and around the Lebanese town of Arsal to discuss the latest developments in the camps and ways to meet the needs of the Syrian refugees in the border area. Activist Khaled Raad said that they had formed a temporary committee to coordinate with the Lebanese government as well as local and international humanitarian organizations to tackle the issues and problems facing Syrian refugees in Lebanon. Activist Ziad Al-Waw said that they are working hard to improve the lives of refugees in refugee camps in Lebanon and to find radical solutions to their problems and meet their daily needs, especially in the town of Arsal. The Activists called on the Syrian Coalition to set up an official committee tasked with consulting with the Lebanese government which they said is ready to deal with the Syrian opposition, particularly the Coalition. Member of the political committee Hadi Bahra said that the Coalition will seek to reach political agreements that guarantee the refugees’ right to safely return to their country as well as to find logical solutions to the problems facing them, especially with regards to legal issues such as the procurement of official documents. He also said the agreement would be aimed at improving the situation of Syrian civilians. Acting on suggestions put forward during the teleconference, the Coalition decided to set up an official committee to work according to a unified vision and adjusts the discourse of the opposition, Bahra said. He added that committee would be tasked with conducting a study to establish safe areas in the western Qalamoun area or near the Zabadani area, noting that the Coalition will communicate with the Lebanese government to this end. 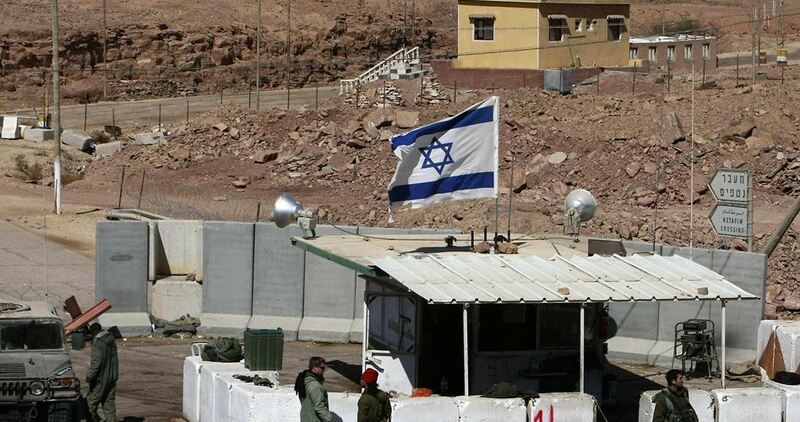 Israel intends to discuss a plan on Monday to build a new settlement near the border with Egypt, Hebrew media reported. According to Haaretz newspaper, the new settlement, which will be called Nitzanit, was planned in the second half of the last decade before it was removed from Israel’s construction agenda in 2010 following strong opposition from local citizens and environmental institutions. However, these environmental groups, including Israel nature and parks authority, support the construction of this settlement now. The new settlement will be built south of the Road 211 that leads to Nitzana border crossing with Egypt, and will consist of 1,600 housing units, commercial areas and 200 hotel rooms.